← Woohoo! I got my 50,000 words done for NaNoWriMo! 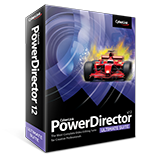 CyberLink PowerDirector is the video editing software I use. Click on the image to go to CyberLink’s product web page. I use CyberLink PowerDirector as my video editing tool for the ham radio videos and the motorcycling/4WD videos—and with every video I’m trying to raise the production values. Version 12 adds more capability, and this time I opted to also purchase ColorDirector and AudioDirector. At first I had some issues with Version 12, but a recent update seems to be addressing most of these. Anyway, if you’re looking for a very good consumer video editing tool, give CyberLink PowerDirector a good look. The magazine Videomaker just reviewed it, and I found the review to be similar to my own perceptions, plus I learned about a few capabilities in the software I didn’t already know! BTW, I was recently contacted by CyberLink and asked if I’d like to join their MVP program. I agreed and sent them some info, but my info hasn’t appeared on their web page yet. As soon as it does, I’ll post more info. About the only thing I’ll do differently is add some how-to videos about video making. Of course, this site already has lots of how-to videos for ham radio and other topics. This entry was posted in Computer Tips, Product Reviews, Video. Bookmark the permalink.